This research investigates using very high and very low frequency sound, standing waves and ‘beat frequencies’ (resulting from the opposition of tones with slightly different frequencies) to explore site-and situation-specific sound practice. 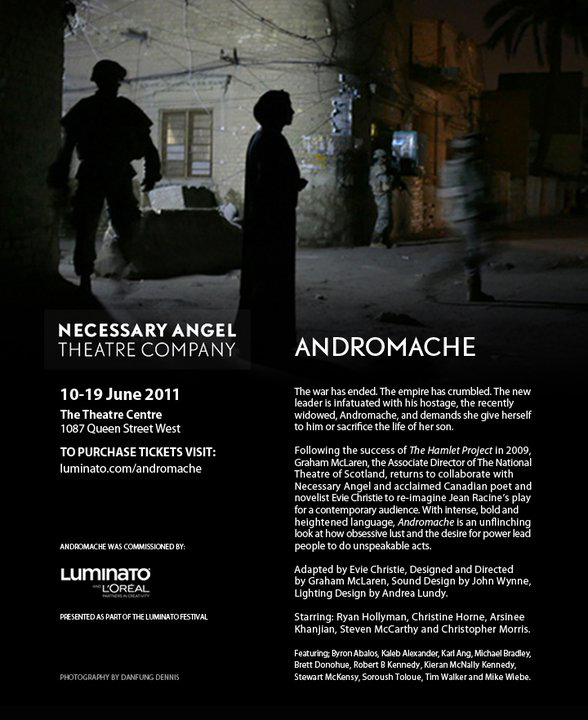 It began with a commission to collaborate with Graham McLaren on a contemporary adaptation of Racine’s ‘Andromache’, Toronto (2011). Wynne designed a unique 16.4 channel sound system; he worked with UK-based technology firm Outboard Electronics to test and apply their new diffusion equipment to create a sonic environment that would impact on audiences without interfering with the actors’ voices (which primarily occupy mid-range audio frequencies). Working alongside McLaren as he designed the set and worked with actors, Wynne co-created a site-specific installation within which the play took place. Wynne was nominated for a Dora Award for Outstanding Sound Design and Composition. This project initiated a continuing research and development relationship with Outboard Electronics. Andromache led to an ongoing series of installations exploring the acoustic properties of architectural spaces. ‘Installation no 1 for High and Low Frequencies’, London 2011, and ‘Installation no 2’, London 2012 were both created during residencies supported by sponsorship from manufacturers of leading-edge audio equipment. A seminar on ‘Sound and Space’ took place at the second, with James Putnam, David Toop, John Wynne and curator Mila Askarova. Wynne’s research developed in situ, using subjective listening and analytical tools to develop unique synthetic sounds in response to architectural acoustics and ambient soundscapes. Experimenting with standing waves and interference patterns, he sculpts the sounding space with invisible but physically palpable sonic material, tuning it so as to physically affect the visitor.